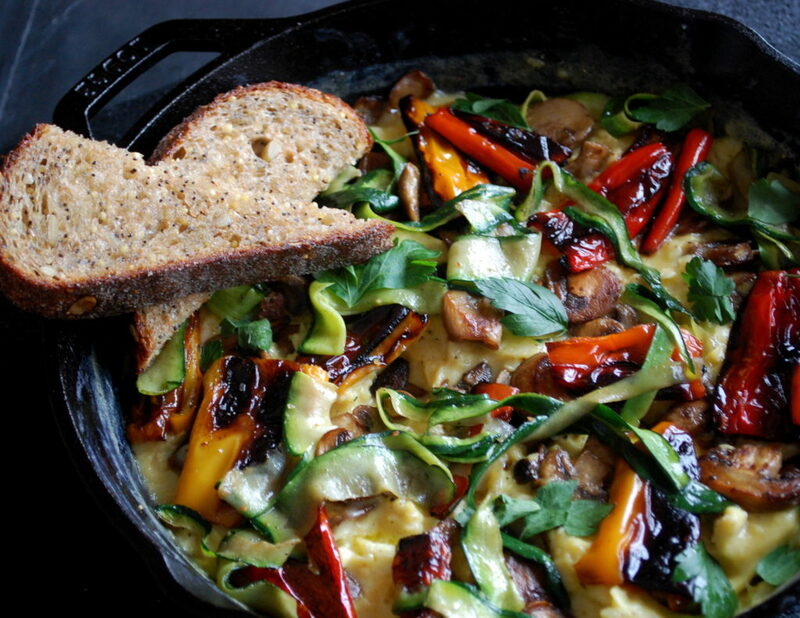 Quick, easy, and full everything you need for a satisfying breakfast…this scrambled egg skillet with vegetables and gruyere is a recipe you’ll want to keep. 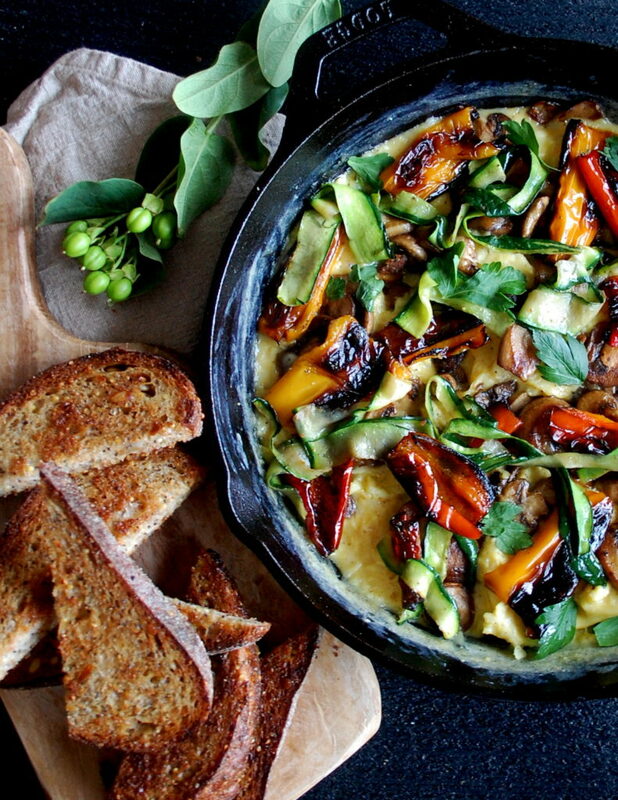 The best part about this is that you can use up whatever vegetables you have in your kitchen. My family usually makes something like this on Sunday for breakfast when we didn’t plan for much and we want to clear out the fridge a bit before the new week. While you want the flavors to complement each other, you really can’t go wrong. A good thing about vegetables is that they usually all taste good mixed together. I’m using baby sweet peppers, mushrooms, zucchini and parsley in this. If I had carrots I’d add strands of those, leeks I would slice into thin rings, cherry tomatoes I would halve and fold right in. The only rule I would follow is to cook each of the vegetables separately. Vegetables cook at different rates, so if you throw them all into the pan at once, you won’t get the good caramelization on each (you’ll also probably overcrowd the pan which results in steaming instead of caramelizing). Take the time to cook each vegetable separately, season them well, get some good color, and then combine them. After that it’s as easy as scrambling the eggs, adding lots of cheese, and baking the whole skillet until it’s gooey and delicious. Enjoy! Preheat the oven to 375F. In a large skillet (or sauté pan), heat enough oil to cover the bottom of the pan over medium-high heat until it is sizzling hot. Add the peppers skin side down and let cook until slightly charred and tender. Season with salt and pepper. Transfer to a plate. To the same skillet, add a little bit more oil if needed and add the mushrooms. Cook until brown and caramelized. Season with salt and pepper. Transfer to a plate. Add the strands of zucchini and cook lightly, just until tender. Season with salt and pepper. Transfer to a plate. Reduce the heat to low and add more oil to the skillet if needed. Season the beaten eggs with salt and pepper. Add them to the pan and scramble until slightly set. Add the gruyere cheese and cooked vegetables on top. 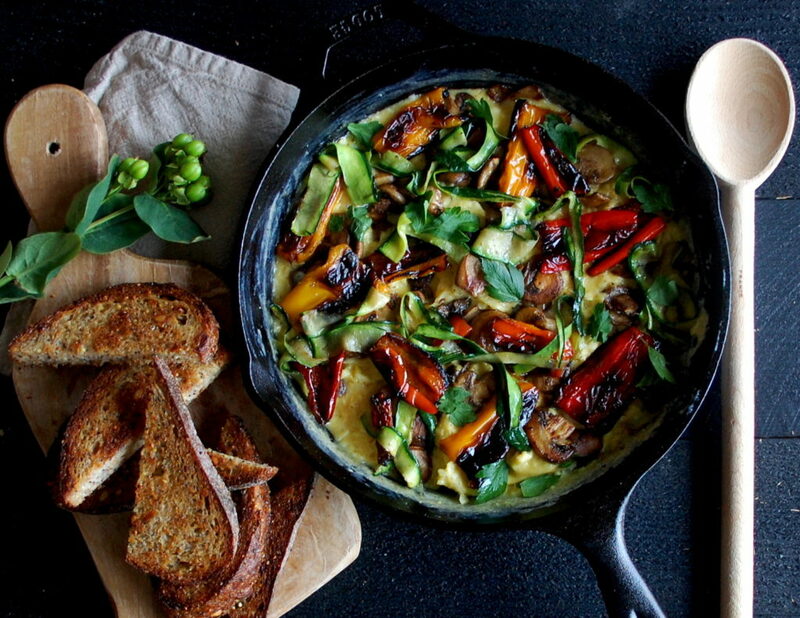 Bake the skillet to melt the cheese and finish cooking the eggs, just a few more minutes. Serve the scrambled egg skillet with a sprinkle of the parsley to garnish.